This particular Stadium is normally reserved for high class sports activities. However a baseball type sport had requested the authorities to stage their nationals at the venue and the authorities had turned down the request. The baseball types had not taken the order lying down. They had approached a powerful young set of sports promoters who had requested the Stadium officials to release the venue for the said nationals. Without even uttering a word the jelly fish of the Stadium officials had agreed. Now this sport is to be held at this venue with much pomp and vigour in the near future! A veterans’ sports meet took place at a stadium in Colombo recently with two teams from a neighbouring country taking part in the event. One team had however protested over a decision and had refused to budge from the track. The local Police were ultimately brought in and even then it was ‘no go’. Ultimately embassy officials from the said country were brought in to evacuate them. Four stamps were issued for a major sporting event which is now taking place in Old Blighty. On close scrutiny a spelling mistake was spotted on the stamps. However it was too late. The stamps had already been released. The strange thing is that two high officials of the sporting world are the big bosses of the Stamp House, who are currently attending the event, are the Big Shots of the local contingent as well. Even they could not spot the blunders! Whilst still speaking about the great sporting event that is taking place overseas, a local player was questioned by pressmen about her bad showing in the game that is being played with feathers. Her answer was that the wind was too hard and that is why she had faltered. The media personnel remained mum not wanting to embarrass her as the event took place in an indoor court! A junior squad took wing to ‘The Land of the Southern Cross’ on Friday to take part in a Junior World Cup that involves willow and leather. This team was accompanied by a top notch cricket official. The question raised was why an official of the junior lot could not accompany the team instead of this senior guy. The junior officials had objected vehemently to the presence of this senior in the tour squad, but it was no use. The officials concerned did not budge and the senior left for the tour probably with a smirk. We who have been involved in sports for some of our best years have been taught to rejoice in victory and be humble in defeat. However a top school from Colombo who had to eat humble pie at the hands of a school from Jaffna at a key competition in Polonnaruwa at first refused to shake hands with the victorious Jaffna team. 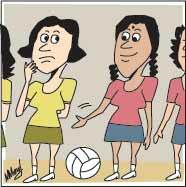 Even officials delayed in announcing the victory which the Jaffna girls obtained by a slender two points. A top cricket official summoned some school cricket coaches for a discussion recently with the intention of getting some fresh ideas. 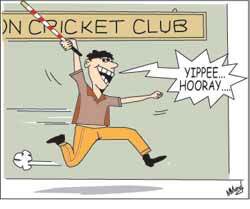 This official however was annoyed when the cricket coaches made some suggestions and even went to the extent of scolding them. The school cricket coaches were left wondering why they were summoned for this meeting at the first place.